Our “Gauntlet” shoot was the first of the 3 looks we did that day! I layered our new “Chapel” dress over intricate fishnet sleeves for some extra detail (and warmth). 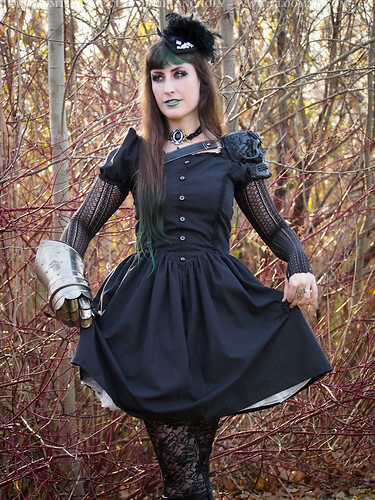 The gorgeous black skull shoulder-piece was created by Hexcelle for her Halloween outfit and when I saw it I just knew it had to be in one of our shoots! 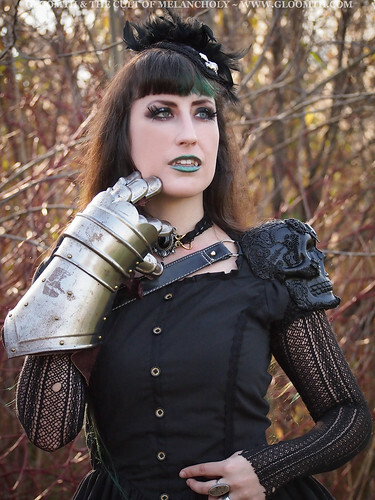 You maybe recognize my metal armor gauntlet from previous photoshoots, it’s appeared semi-frequently. For the makeup in these shoots I wanted to create 1 look that could be updated easily on location that’d suit 3 different concepts. I went with a soft black eyeshadow with a white accent, as well as several layers of lashes. For the “Gauntlet” series we incorporated a pair of vampire fangs and green lipstick from NYX. The gorgeous choker shown was provided by Alchemy of England. There are lots more photos in this series in our flickr album. Thanks to Hexcelle and Alchemy of England for making this shoot so amazing!!!! ← New “Vintage Toy” Print Leggings!